I thank my lucky stars that the internet wasn’t a thing (at least for me) when I was growing up. For many many many reasons! While this meant that my childhood days were filled with playing outside, riding bikes, reading books, getting bored, it also meant that there were less opportunities to become instantly famous. Not that I had any aspirations to do so. I was happy with my Baby-Sitters Club books and weekly slumber parties! This is where it’s important to note a couple of things about my parents. My mom was interested in learning more about things like baby photo contests and beauty pageants. Fame had nothing to do with it for her. My mom’s a creative girly girl and thought it would be fun for us to take part in these kinds of activities. My dad, on the other hand, was 100% against that kind of stuff. So we never did any of it. For me and Vishnu, the conversation is a little different. It’s not about pageants and photo contests, it’s about whether or not we’ll even post pictures of our children on the internet. I brought all of this up during dinner last week and learned something very interesting. I was thisclose to being famous. It all started when my mom and I travelled to India for four months. This was my mom’s first visit after leaving to settle in the US. On top of that, I wasn’t even two years old yet. A huge deal for our little family of three on so many levels. The biggest being that my dad would be alone for four months. Funny side note – our neighbor at the time was convinced that mom left my dad even though he told her where we really were! Anyways, my mom and I had a grand old time in India. My grandparents and aunts were so excited to have us. My mom said that I quickly went from missing my dad and crying all the time to being the life of the party. My close encounter with fame came towards the end of our trip. One of my dad’s best friends owned an ad agency at the time, and one of his clients was Parle G. Parle G is a brand of Indian biscuits/cookies. Apparently it’s the largest selling brand of biscuits in the world. And on the cover of the packaging, there’s a picture of a super cute little Indian girl…the face of Parle G.
That face could’ve been mine! My dad’s friend wanted to use my picture in a campaign! What happened, you ask? Well, my mom was ok with it and didn’t think it was a huge deal. However, when she called my dad to ask him, he said no. He didn’t want my face on the world’s best selling biscuits. And that was that. Now if you’ve met my dad in real life, you know that he’s one of the gentlest, most laid back people in the world. But when he says no, he means it. But in all seriousness, I get it. Seeing your kid’s face on a package of biscuits would be a little weird and unsettling. And I guess there’s that whole thing about privacy too. Good decision making, dad! And that’s my story about being almost but not quite famous! Did you ever have any almost famous (or really famous) moments? well i don’t know if i would have become famous or not but one of my friend had asked me to be in Nepali music video..and you know how went with my parents…which is why I chose dietetics instead of modeling 😛 😛 i was secretly praying for my parents to allow it but now i look back, i am so glad i didnt do anything like that..maan you missed out on the opportunity to be parle queen, but that would have been weird. What an awesome post to read first thing in the morning. It took me back in to that memory land of our first visit together back to India 🙂 and love this cute little face of yours on Parle-G!! What a cool story! Thanks for sharing! Parle G cookies are a huge part of our daily chai routine! Oh man! That would have been something but I totally get your dad’s stance! 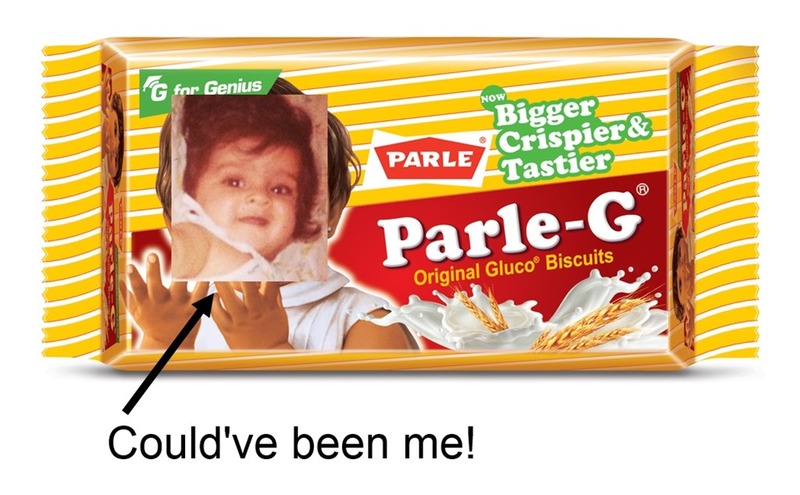 Funny thing is, when my older son first saw the Parle G packet when he was 3, he thought it was his own pic, and he did look a lot like that! So, we just let him believe that it was his personalized biscuit packet!! That’s awesome! I’d probably tell my kid the same thing. Wow!! Never knew this about you. The closest I came was being tint the newspaper when I was 6 years old because I was the youngest player at the junior Olympics to get a gold medal in table tennis….oh the days!! I just learned about this recently! This will be a great story to tell your kids! I love it. So true! It’s a fun one to think about! Such a fun story! I don’t think I’ve ever even come close, haha.